This tribute to Sam Cooke comes from Grennville, SC and From Sam To You And I is really a version of “A Change Is Gonna Come”. 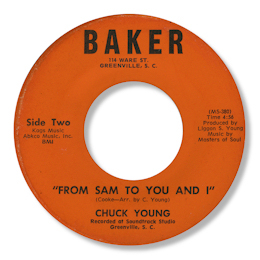 Chuck Young had the decency to credit Sam on the label, adding “arr by C Young” to cover the amendments he made to the original song. The rap at the start is nicely judged and when he starts singing, it’s clear that Young has a good strong gospel based voice and he finishes on a fine falsetto note.